Travel to Ecuador and discover Quito, the oldest capital in South America, the waterfalls of Banos, the volcanos of Riobamba and the charm of Cuenca. Explore the Galapagos Islands, a UNESCO and enjoy its spectacular flora and fauna on the islands of Santa Cruz & San Cristobal. Relax on the paradise beaches and look out for the giant Galapagos tortoise. International flights U.S. - Quito - U.S.
12 Breakfasts and 1 lunch. Excursion on a Traditional Ecuadorian Chiva. Riobamba: Mansión Santa Isabella or Casa Real. Cuenca: Posada del ángel, Inca Real or La casona. San Cristóbal. Blue Marlin, Katarma, GPS Eco Friendly or GPS Planet. The optional train journey in Ecuador, which you can reserve in the next step of the booking process, does not operate on Mondays and on Wednesday. It is mandatory to send a copy of the valid passports of all passengers to customerservice@exoticca.com once you have made your reservation. It is essential to fill in the passport information correctly for each passenger in the given boxes at the end of the reservations process. Transit control card (TCC)* (20 USD) and entrance to the Galapagos National Park * (100 USD). Arrive at the airport to board the flight to Quito. Overnight flight. Arrive in Quito, the capital of Ecuador and a city famed for its high vantage point in the Andean mountains, and its ancient Incan significance. Transfer to your hotel and spend the rest of the day at your leisure, exploring the relaxed culture of the Ecuadorian Sierra. Overnight stay. After breakfast, meet with a local guide who will take you on a fascinating guided tour of some most emblematic sights of Quito. Explore the Historic Center, declared a World Heritage Site for its great beauty, and also discover the city's traditional market where you can taste a great variety of tropical fruits grown in Ecuador. Spend the afternoon at your leisure. Overnight stay. Breakfast at the hotel. Set off towards Banos, a subtropical area close to the Amazon basin, known for its beautiful hot springs. On route, pass through the Cotopaxi National Park on a panoramic tour, where you can see a wonderful panoramic view of the active volcano Cotopaxi. Then, stop at the impressive volcanic lake of Quilotoa. The water is the lake is an amazing green colour due to the high mineral content of the volcanic terrain. After Quilotoa, stop in the small artisan town of Tigua and visit an artists workshop where you can discover the intricate and colourful art of the region. Continue to Banos, arrive and transfer to the hotel. Overnight stay. Breakfast at the hotel. Set off on an adventure to the stunning Banos Waterfalls on board a traditional Chiva, the typical transport of the Ecuadorian coast. In the afternoon, take time at your leisure to visit the waterfalls (entrance not included) or discover the city of Banos. Overnight stay. Breakfast at the hotel. Journey through to the province of Chimborazo on route to El Chimborazo, the highest volcano in Ecuador standing at 6,310 meters. It was estimated that the last eruption was around 550 a.D. and therefore it is a dormant volcano. Enjoy the beautiful views of the volcano, the surrounding landscape and lush vegetation. Stop at the interesting "Palacio Real" community, a complex at the foot of the volcano before arriving at the city of Riobamba, which has a large indigenous popular and colourful culture. Spend the rest of the day at your leisure. Overnight stay in Riobamba. Breakfast at the hotel. In the morning visit the quaint towns of Guamote and Alausi, before heading for the fascinating ruins of Ingapirca, the largest and most well preserved Inca ruins in Ecuador. Discover the ancient city and wonder at the history behind the ruins. We recommend an optional excursion to 'The Devil's Nose' by train. * Continue to Cuenca, thought to be the most beautiful city in Ecuador, and spend the rest of the day at your leisure, discovering the beautiful waterfront and old colonial plazas. Overnight in Cuenca. Breakfast at the hotel. Spend the morning exploring Cuenca at your leisure. In the afternoon depart to Guayaquil, the largest city in Ecuador, located on the coast. On the way, stop in the impressive Cajas National Park, known for its glistening lakes and home to the mighty Andean Condor. Stop at a local cocoa community to discover how chocolate is made from the humble cacao tree, the process from the cacao tree to the chocolate bar, and then taste the chocolate. Continue towards Guayaquil, transfer to the hotel and overnight stay. *Note: The ferry ride from Baltra to Santa Cruz is not included and has an additional cost of $1. Breakfast at the hotel. Take the day at your leisure or choose from our optional excursions to discover the delights of the Galapagos. * Overnight in Santa Cruz. *Optional Uninhabited Island Excursion: Travel by boat to an uninhabited island in the Galapagos archipelago, for the best opportunity to admire rare and beautiful wildlife. Spot colorful fish, sea turtles and maybe even the rare blue-footed boobies. Includes lunch and snorkeling equipment. Price per person: $275. Breakfast at the hotel. Enjoy the morning by exploring the beautiful island of Santa Cruz at your leisure. In the afternoon take a motorized boat to the island of San Cristóbal. Enjoy watching the passing islands from the boat and look out for the varied marine life. 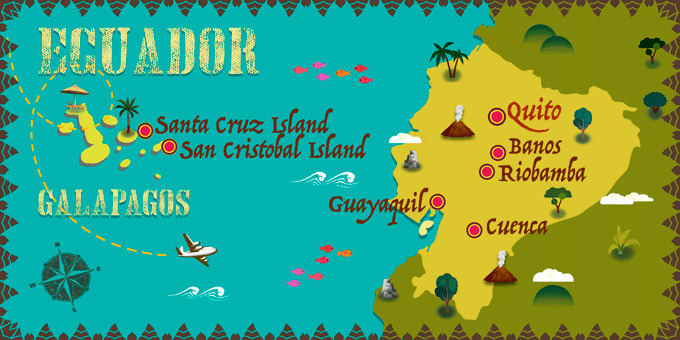 Arrive on the island of San Cristobal, transfer to the hotel and an overnight stay. Breakfast at the hotel. Spend the day at your leisure, or we recommend taking an optional excursion of your choice. * Overnight in San Cristobal. *Optional Uninhabited Island Excursion: Travel by boat to an uninhabited island in the Galapagos archipelago, for the best opportunity to admire rare and beautiful wildlife. Discover the unique rock formations of the islands and enjoy watching the colorful and unique birdlife. Includes lunch and snorkeling equipment. Price per person: $175. Breakfast at the hotel. At the indicated time, transfer to the airport for a flight back to Quito. Arrive in Quito, transfer to the hotel and spend the remainder of the day exploring at your leisure, soaking up the unique atmosphere and enjoying the Ecuadorian cuisine. Overnight stay. 14th Day: Quito - U.S.
Breakfast at the hotel. At the indicated time, transfer to the airport for a flight back to the U.S. Note: Depending on the flight departure time you may arrive back in the U.S. today, or tomorrow. Galapagos transit control card (TCC) is mandatory and is checked at the airport in both Quito and Guayaquil before travel to the Galapagos Islands. Cost 20 USD per person (subject to change) and made by cash payment. At the airport Galapagos passengers must present their transit control card (TCC) with their passport and pay the entrance fee to the Galapagos National Park. Cost:100 USD per person. In the event of any changes to accommodation, they will always be of the same, or a higher category. The category of hotels is not standardized across all countries in the world. For this reason, the criteria may differ depending on the destination country's own standards. Riobamba: Hacienda Abraspungo or Hacienda Andaluza. Cuenca: Santa Lucia or Hotel Cruz del Vado. San Cristobal: GPS Sunset balcony rooms or Hotel Golden Bay. *Note: The ferry ride from Baltra to Santa Cruz is not included, there is an additional cost of $1.